$1.98 Winco TMT-RF2 Refrigerator/Freezer Thermometer 2"
$1.86 Winco TMT-RF4 Refrigerator Freezer Thermometer 4-3/4"
$2.58 Winco TMT-RF3 Refrigerator/Freezer Thermometer 3"
Determine whether food is being stored at a safe temperature with CDN RFT1 ProAccurate® Heavy Duty Refrigerator / Freezer Thermometer. Equipped with an easy-to-read 2" dial display, this thermometer provides a clear view and is calibrated to read temperatures between -20 and 80 degrees Fahrenheit. 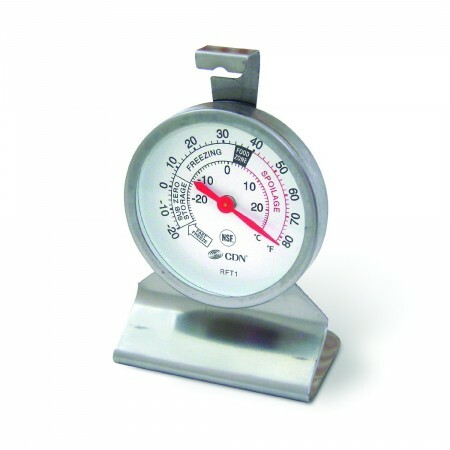 For long lasting performance, this NSF approved refrigerator / freezer thermometer is equipped with a durable laboratory glass lens and is crafted from rust-resistant stainless steel.